Before you sit down to determine the best type of turf for your next project perhaps you could take a few minutes to understanding what grass actually is and how it works. The Gramineae (or grass) family of plants is one of the largest on Earth, encompassing over 9000 known species. Why so common and wide spread? It’s simple – grass has a simple structure and a simple way in which they function and grow – simple! The fibrous roots of grass grown down, extending into the soil, collecting valuable water, minerals and nutrients and acting as an anchor to ensure the grass plant stays where it is meant to. The stems or culms grow from the crown/base of the plant and are hollow and rigid except where the segments of the stems joint at the nodes. Above the nodes and from the culms come the leaves which alternate the direction they grow from as they move up the plant. If the first leaf grows to the left then the next will grow to the right and so on and so forth. On the leaf is the sheath (lower part) and the blade (upper part) and they are vital to the health of the grass plant. The leaves are responsible for the process of photosynthesis; turning sunlight into energy. And the by-product of this process is chlorophyll which gives the grass the lush, green colour it is famous for. With some types of turf, reproduction occurs through their flowers. The florets will grow together in groups or spikelets and then produce spores that pollinate other flowers, which in turn produce seeds. Many varieties of grass grown commercially have been bred to be infertile, so they cannot be grown from seed. These turf types do however have additional stems that grow out from the lawn plant. The under-ground stems are called stolons and above the ground stems are rhizomes. Both will reach out from the original plant and establish new culms and therefore will continue to nurture the new grass plant until it is strong enough to support itself and thrive. 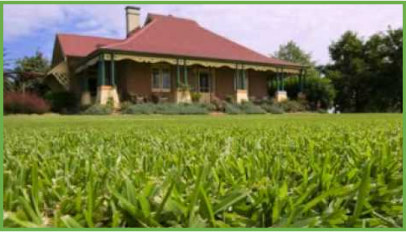 By understanding what grass and how it works will help you to better care for your lawn and ensure that you undertake the right lawn care requirements for healthy stems, roots, leaves and access to sunlight. Healthy grass will be able to self-repair bare patches and ward off pest and weed invasions.